When her sister is kidnapped by white slavers, only Grandpa knows what to do. He puts in a call to a fictional hero, Jake Speed. She is amazed to find that he actually exists, and that as flesh and blood, is much less formidable than his reputation. "Jake Speed" is a low-budget b-grade comic book fantasy adventure caper where the pages simply come to life in a sprawling caper of impulsive thrills, laughs, mayhem and energetic performances. It pretty much spoofs the genre (heroes vs. villains) and it's quite a clever spin on the material too with its fairly witty script, despite how the routine story comes together. The adventures that Jake Speed goes on are what his novels are all about. Nor does he make it easy on himself, because where's the adventure and entertainment in that. Simply there's no other way. Like Speed said "It reads better". Crawford is likable as the rugged Jake Speed and as well as his resourceful partner Des played perfectly delivered by Dennis Christopher. In the role as Margaret is a feisty Karen Kopins. Then the villains are played with hammy glee by John Hurt and Roy London. Also popping up in minor parts are Donna Pescow, Alan Shearman and Ken Learner. Plus there's an interesting instrumental cover of Flashdance's "Maniac" in a grungy looking South African bar. It's quite a sight. An always amusing and bouncy enterprise. 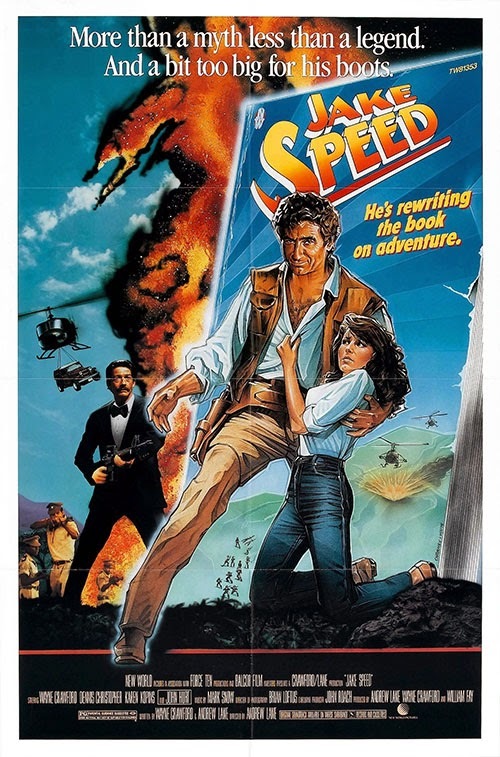 0 Response to "Jake Speed (1986) Andrew Lane"